After an uproar from the Opposition for the removal of Karnataka minister K.J. George in connection with police officer M.K. 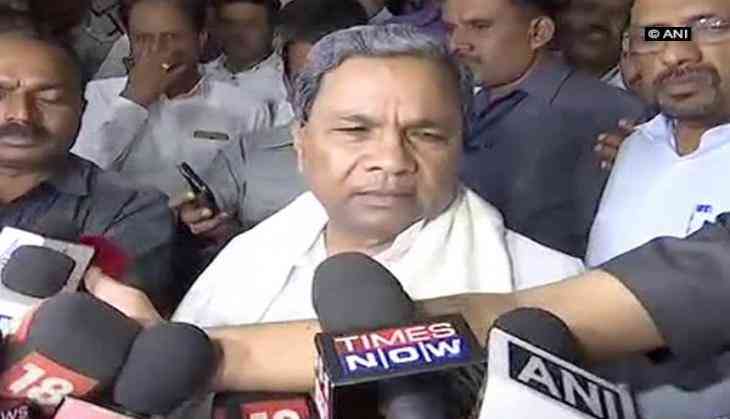 Ganapathy's suicide case, Chief Minister Siddaramaiah has called for a meeting of senior ministers at Vidhan Soudha in Bengaluru on 27 October. The Bharatiya Janata Party (BJP) yesterday demanded the removal of George from the Karnataka Cabinet after the Central Bureau of Investigation (CBI) registered a case against him in connection with the suicide of a police officer. Earlier, the CBI had registered a case against Karnataka minister K.J. George, Inspector General of Police (IGP), Lokayukta, Bengaluru, Pranab Mohanty and Additional Director General of Police (ADGP) State Intelligence, AM Prasad in the M.K. Ganapathi's suicide case. All three have been named as accused in the case. M.K. Ganapathy allegedly killed himself in a lodge in Kodagu on July 7, 2016 when he was the Deputy Superintendent of Police, Mangaluru. In a video message, he named K.J. George, A.M. Prasad and Pranab Mohanty responsible for his extreme step. On 5 September, the apex court ordered a CBI investigation into the former cop's suicide. While hearing the plea of Ganapathy's father, M.K. Kushalapp, the Supreme Court said that "there are certain startling facts in the case. Whether it is murder or suicide, it is required to be investigated in a fair manner." Kushalapp had moved the apex court, challenging the order of the Karnataka High Court, which rejected his plea for CBI probe into the death case. The Karnataka Government opposed the plea in the Supreme Court and submitted that a thorough and in-depth probe had been conducted in the case. K.J. George is the Minister for Bengaluru Development and Town Planning. He was previously the Home Minister of Karnataka. He was also the Minister of State (Independent Charge) Transport, Food and Civil Supplies in the Veerendra Patil government and Cabinet Minister for Housing and Urban Development in the S. Bangarappa government.